His Excellency and Mrs. Radinck van Vollenhoven had kindly invited Dutch Nationals and selected guests at their home for a celebration of the Queen's birthday. As always, the hosts had gathered an interesting and entertaining crowd of young and old, including a KLM crew who landed with their noses in real bitterballen, haring and the 'green stuff', of which lots were graciously provided. 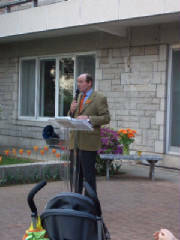 The Ambassador led the crowd into a "Wilhelmus", professionally conducted by Arthur Arnold. The afternoon sped into evening as guests enjoyed each others' company meeting new and old friends. Thanks go to Mr and Mrs van Vollenhoven for an excellent event.